Typically, at the beginning of December, asphalt plants begin to close up shop for the winter months. Since we are already mid-way into November, at this point, any pavement repair and/or maintenance items your parking lot needs should have already been completed, or they should be scheduled to be completed within the next couple of weeks. Going into winter with a pavement that has been prepared can help to decrease the amount of damage a harsh winter can cause. While potholes, and pavement damages are inevitable during the unforgiving months of winter, major and costly damages can be prevented, or at least lessened, if you complete these important winter preparation items before December. Once paving companies are closed for the season, and the temperatures reach a state that is unworkable, only temporary fixes can be done. Infrared repair – Using innovative machinery to heat and soften the surface allows for it to be workable in any weather above 0 degrees, allowing for asphalt repair to be conducted through otherwise “off season” months. 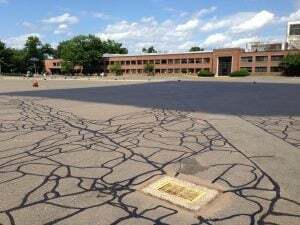 If your parking lot is suffering from potholes, and any other tripping hazards during winter, you can call EastCoat Pavement to come out and execute these temporary repairs to help avoid larger damages as the winter progresses. Once spring hits again, we will make sure to fix these problem areas completely with our more permanent methods of asphalt repair. Saw cut and patch – This involves cutting and removing damaged areas and refilling them with hot mix asphalt. Milling – This involves the grinding of the pavement’s surface to a desired depth, then a new layer of asphalt pavement is laid on top to match the thickness of the surface that was removed. Remove and repave your parking lot completely is necessary. If you have not completed the repairs mentioned earlier at this point, now is the time to actively get this done before we see our first snow, and temperatures continue to drop. Since the temperatures fluctuate so much in winter from below freezing to above freezing, a considerable amount of thawing and freezing takes place. This thaw-freeze cycle aids in creating cracks and pavement damages due to expansion and shrinking associated with water changing to ice, and back to water again. If your pavement’s winter checklist is not yet complete call EastCoat Pavement today to book your pavement repair appointment! 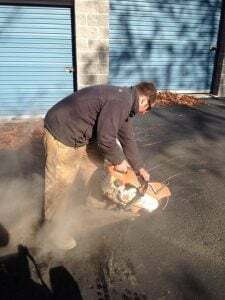 Preparing your pavement now can potentially save you big bucks come spring!